Almost 8.5 million people enrolled in health insurance through the federal HealthCare.gov exchange during this year's open enrollment, despite the absence of the individual mandate and easier access to skimpier but cheaper coverage outside of the exchanges. The near-final tally fell short of last year's sign-ups by about 4.2%, or 367,000 people. 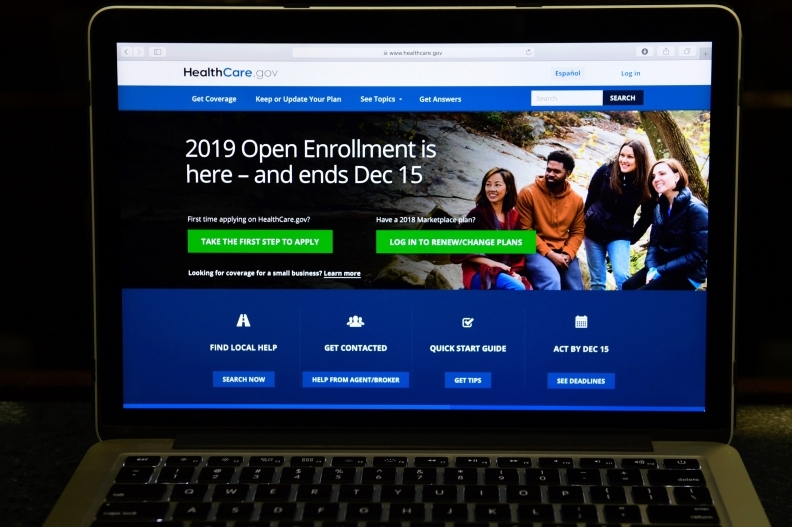 But the CMS data released Wednesday showed that a last-minute surge in plan selections and auto-enrollments narrowed the gap, with 4.3 million people enrolling in the final week of open enrollment, about 318,000 more than last year. The gap between 2019 and 2018 could shrink further—the CMS said its data doesn't include plan selections for people who enrolled in the last three hours of open enrollment, or those who left their contact information at the call center due to high volume, the CMS said Wednesday. It also doesn't include enrollment figures from states that operate their own exchanges. The CMS is expected to release revised enrollment next week and data that includes state-based exchanges in March; some states are not done with their open enrollment. Larry Levitt, senior vice president at the Kaiser Family Foundation, tweeted Wednesday that the sign-ups for 2019 coverage show the federal ACA marketplace "is far from dead and remarkably resilient." In a statement, CMS Administrator Seema Verma said the "steady enrollment numbers are yet another sign that the Administration's efforts are working" and blamed the dip in enrollment on a lower unemployment rate and lower average premiums. Verma took to Twitter to dispel criticism that the Trump administration's expansion of short-term plans and Congress' move to zero-out the individual mandate penalty contributed to the drop in sign-ups, pointing to New Jersey as an example of one state that instituted its own mandate and banned short-term plans, but still experienced lower exchange enrollment. Experts who track open enrollment from year to year weren't sure what to expect this year. They said the wider availability of association and short-term plans, coupled with the zeroed-out penalty for not having insurance in 2019, was likely to lure healthy individuals with incomes too high to qualify for federal financial subsidies away from the exchanges. The Trump administration also slashed the federal budget for HealthCare.gov marketing and advertising by 90% to $10 million this year, and gutted funding for ACA navigators who assist people in enrolling in coverage. Moreover, polls had shown that many Americans were unaware of the Dec. 15 deadline to enroll in HealthCare.gov coverage. Some health insurance industry experts also worried that a Texas federal judge's ruling last week that the ACA is unconstitutional could confuse people and deter them from enrolling. On the other hand, average premiums for benchmark silver plans are falling by about 1.5% in 2019 after years of sharp increases. But they could have been even lower. Health insurers increased premiums by an average 6% to account for the missing mandate penalty and the expansion of short-term plans and association health plans, according to an analysis by the Kaiser Family Foundation. More insurers are participating in the ACA exchanges this year, so many Americans have more choices for health plans. The number of U.S. counties with just one insurer declined from 50% to 35% for the 2019 plan year, according to the Robert Wood Johnson Foundation.